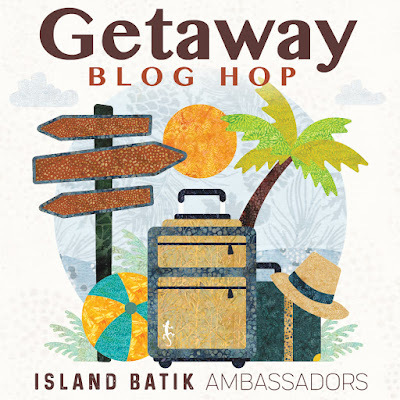 Welcome to the Getaway Blog Hop with Island Batik! The Island Batik Ambassadors are showing you all the newest collections from Island Batik all month long! 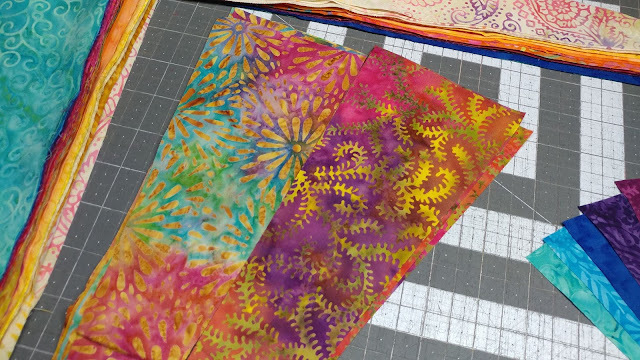 Be sure to visit all the stops on the blog hop to see what's new with Island Batik (blog schedule at the bottom of this post). Island Batik sent me a half yard bundle of the Boho collection to play with for the blog hop. Boho is shipping to stores right now, so be sure to tell your local quilt shop you'd like for them to order it! The collection has 21 fabrics that are mostly warm with just two blue/teal fabrics for a fun pop of cool! 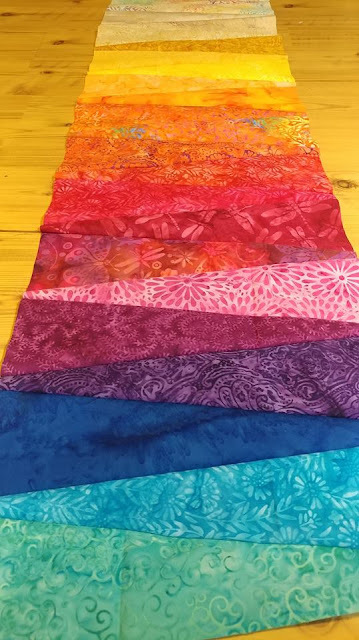 When I first received the fabrics in the summer, I made a double-sided kennel quilt that the Island Batik sales reps used at Fall Quilt Market to show quilt shops the new fabrics. Once they were finished using it, it was donated to an animal shelter! I asked my husband what the first thing to pop into his head was when he saw the fabrics: "sunset!" I agreed - so I set out to make a Bohemian sunset quilt. From each fabric, I cut two long and skinny wedges. I cut them so they were 1" on the narrow end and 3 1/2" on the wide end. A template or Dresden ruler would definitely make this use less brain power! 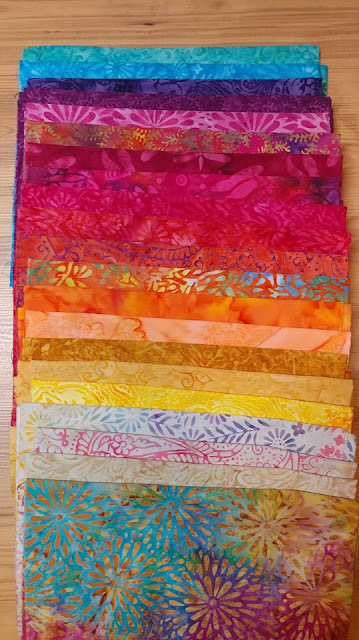 I added a few additional Island Batik blender fabrics from my stash to the pile, then decided a couple of the Boho fabrics just didn't fit into my sunset. I decided to save those fabrics for the back. Once cut, I sewed the wedges together just like regular tumblers. 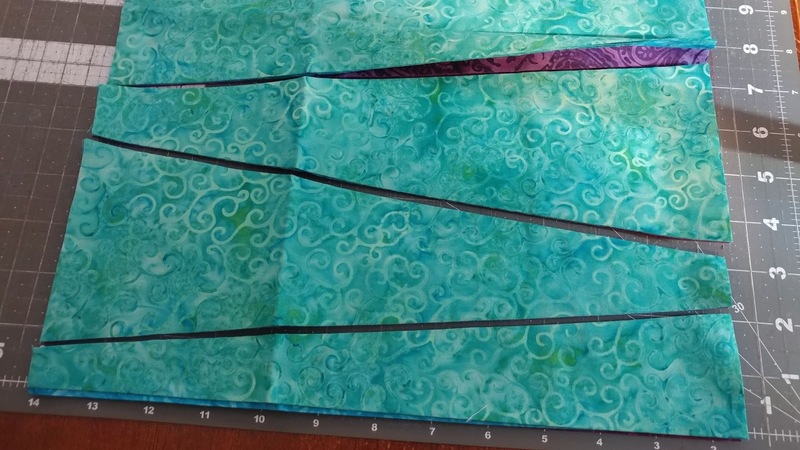 The trick to sewing shapes with angled sides is to offset the shapes just enough so that your scant 1/4" stitching line starts right at the "V" where the two fabrics meet. All of the piecing was done with Aurifil 50wt Stone #2324. 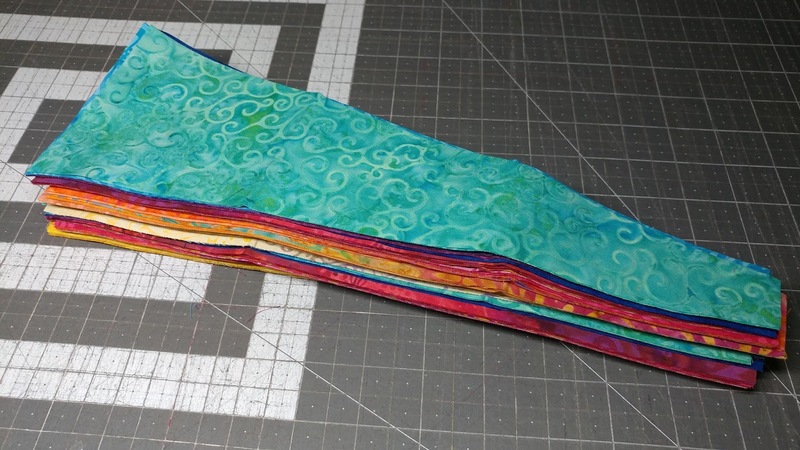 Instead of piecing the quilt in rows, I pieced it in columns. 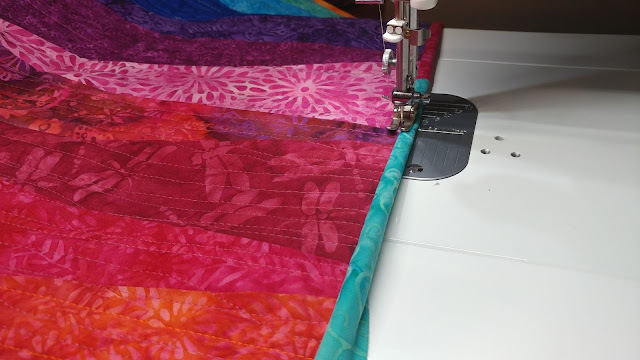 After sewing four columns, I used some of the leftover fabric pieces to make the quilt back and loaded the quilt onto the longarm. I used Warm & Natural batting. I picked a bright sunset of Aurifil 50wt threads for the quilting (from left, #2135 Yellow, #1104 Orange, #2455 Medium Carmine Red, #1240 Very Dark Eggplant, #2735 Medium Blue, and #1320 Bright Teal. Starting at the top of the quilt with my usual #2324 Stone, I quilted "organic" horizontal lines across the width of the quilt. 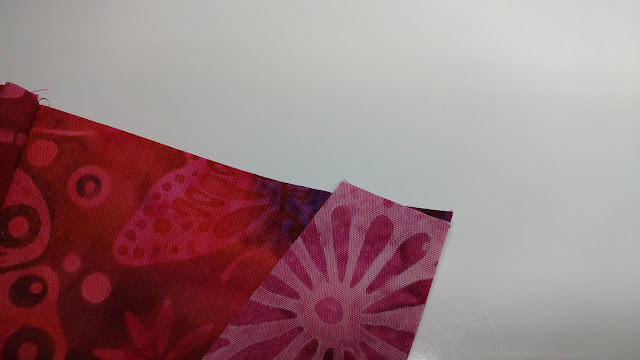 I do not have channel locks on my longarm, so these were just freehanded as I pulled the machine back and forth. 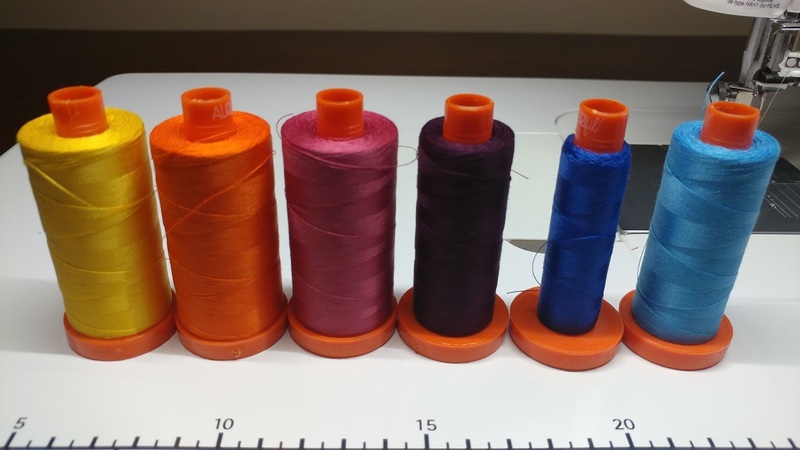 When the color of the fabric changed, I changed the thread color too. I let the lines overlap and quilted a couple lines beyond the matching fabric color into the next fabric color as well. Based on the scraps I had left from the bundle, I knew a scrappy binding was the only way to go. The finished quilt is a perfect size for a lap quilt. It measures about 44" x 48". The back has a fun patchwork look to it! And the front really does remind me of a sunset! This quilt has me dreaming of a warm beachy vacation - quite the contrast to the ice and snow we're experiencing here in Missouri right now! Now for a giveaway! Giveaway closed. Would you like to win my Boho scraps and a copy of one of my patterns? To enter, just comment on this post telling me where you've seen your favorite sunset! And PLEASE leave your email address in your comment if you're a no-reply commenter. Otherwise I won't be able to contact you if you win! (Giveaway is US only and ends February 2nd). 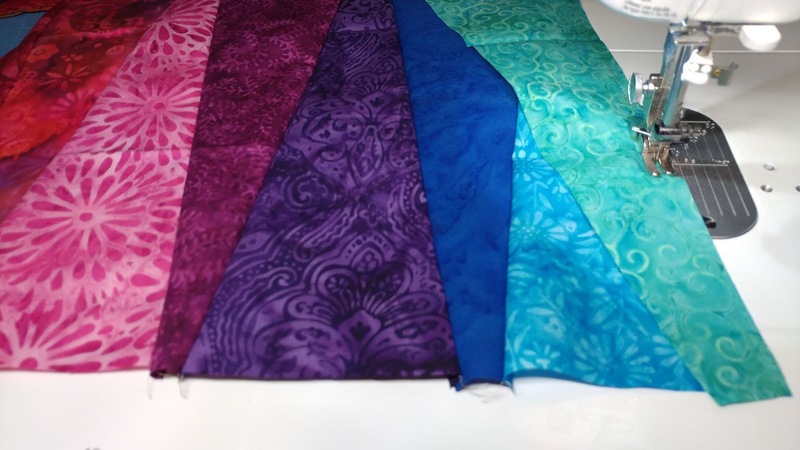 Want to see the other new fabrics from Island Batik? Be sure to visit the Island Batik page first, then all the other bloggers on the hop! There are posts planned for all of January! Slice of Pi Quilts <----That's me! Linking up with Finished or Not Friday at Busy Hands Quilts, Can I Get a Whoop Whoop at Confessions of a Fabric Addict, TGIFF at Alycia Quilts, Friday Foto Fun at Powered by Quilting, Main Crush Monday at Cooking Up Quilts, Monday Making at Love Laugh Quilt, What I Made Monday at Pretty Piney, Linky Tuesday at Freemotion by the River, Wednesday Wait Loss at The Inquiring Quilter, Midweek Makers at Quilt Fabrication, and Needle & Thread Thursday at My Quilt Infatuation. My favorite sunsets were the ones I watched over the ocean from our home in San Clemente, CA. I miss those! 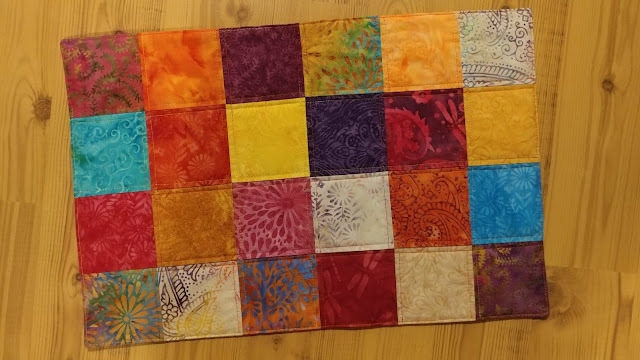 Beautiful sunset quilt, Laura! The gradation is perfect. I am happy to follow your creations as an ambassador in the coming year! 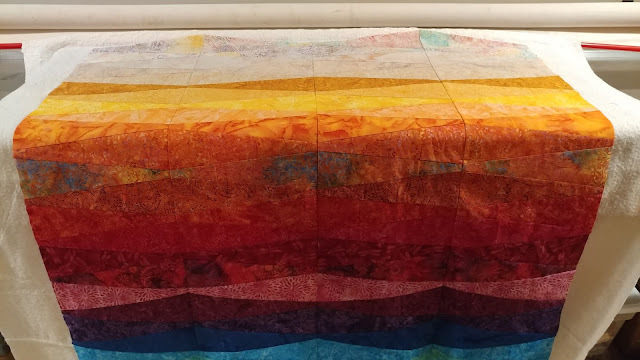 Your quilt does indeed look like a sunset. Very pretty! My favorite sunset was behind my house overlooking the lake. Thank you for the giveaway. Texas. How does one post email address without it being public? Niagra Falls when I was in high school. We took a family trip and drove across Canada from Michigan. The area we traveled was gorgeous! My favorite sunset was in Tucson in the desert. I love the look of your quilt. So simply but so nice. My favorite sunset would be from my work window before we moved to another bldg. We had a large window and at certain times the colors were really beautiful. It was neat when someone said "look out the window." I love your quilt and had to look twice because I thought there was curved piecing in it. My favorite sunset was on Marco Island along the Gulf Coast of Florida when our children were little--quite a few years ago. I love the sunsets over Lake Erie. Your quilt is just beautiful! I would have to say I saw my most favorite sunset in Hawaii! Can never see too many of those. Even though I miss my home back in California where the sunsets are spectacular, I have to say the most fiery and beautiful sunsets I have seen were right from my yard here on the Olympic Peninsula in Washington. Your quilt had me saying Aaaahhh! I would say Hawaii. The warm weather does it. 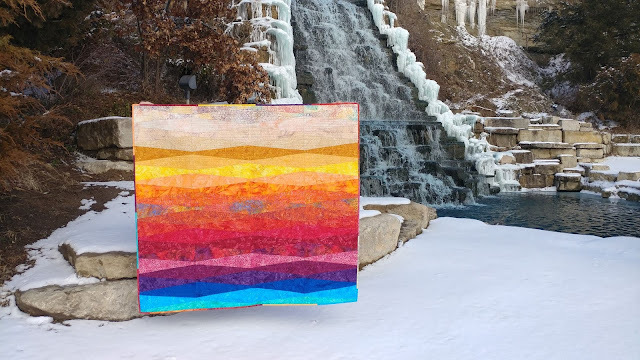 I love your Sunset quilt! I may make a smaller version with my Boho leftovers. I am not entering the giveaway. My favorite sunset is anywhere near the ocean. I totally love your interpretation of a sunset. I fell in love with watching the sun set on Jekyll Island, Georgia. Your quilt is beautiful, Laura! My favorite sunsets are those we see right here at home, in the foothills of the Sierra Nevada. I've seen lots of pretty sunsets, most recently a gorgeous one driving through Yellowstone National Park. Love your quilt, totally beautiful! Can't say I have a favorite sunset; they are all unique and beautiful. However, a great place to view them is on plains of Colorado. Your quilt is truly awesome! My favorite sunset of all time was at Maho BayB on the island of St John USVI. My recurring summer favorite is at Schroon Lake in that Adirondack mountains of New York state. Your quilt reminds me of the Carribean. My favorite sunset was from my parent's house when they lived in New Mexico, there's just nothing like a New Mexico sky! My favorite sunset has me torn between the ones I see in Florida when I visit my daughter and the ones we see when we go "up north" to Duluth and watch the sunset over Lake Superior. 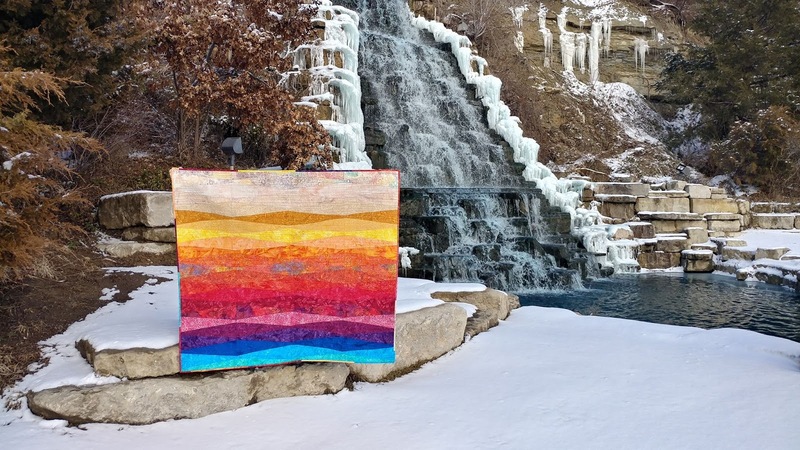 Your quilt captures a beautiful sunset perfectly! This is the most amazing way to show those fabrics in glorious colours. As I am in NZ, not able to enter the giveaway, but in the South Island, with the last rays of the sun on the snow capped peaks of the Southern Alps,my pick. Totally gorgeous, Laura. Love where you've photographed it! What a fun design to show off those beautiful fabrics. Love the background with the frozen waterfall too! I love your sunset quilt! The colors are amazing. I have seen some great sunsets in our Vermont town. Our previous house faced West, and we saw so many great sunsets. Now I can't see them as well from the house, but we still have them! Gorgeous quilt! My favorite sunsets were watched over Lake Michigan. 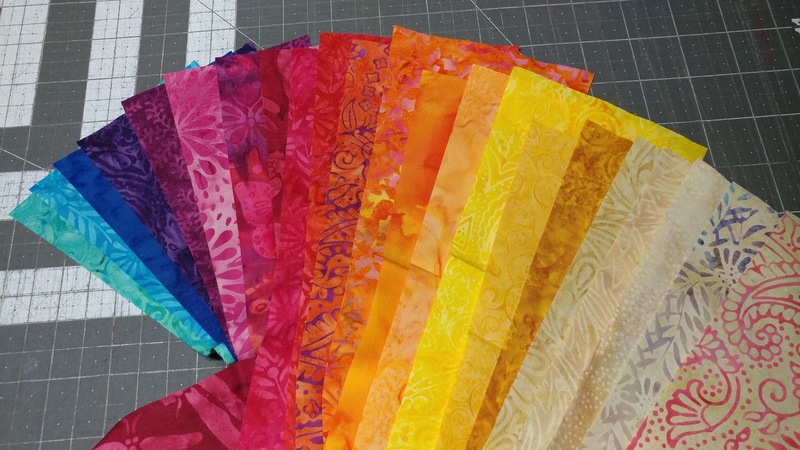 What a fun quilt design and method. 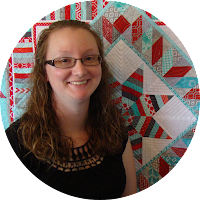 I love that you even give good info about the way you chose to quilt it. 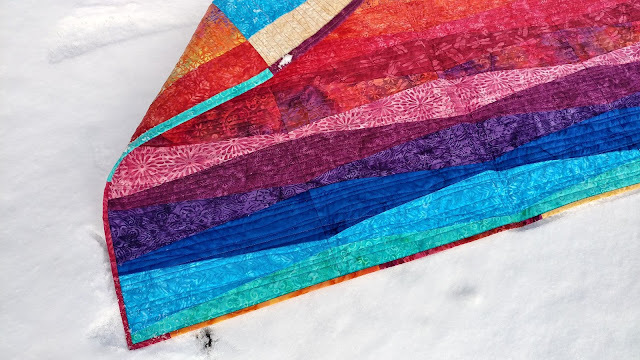 That is wonderful, even if people don't do exactly that, it gives them a headstart with ideas, rather than feeling frozen when looking at their quilt. One of my favourite sunsets was at Cape Cornwall in England in 2017. I love this quilt - thinking island life for sure. I think I would like to win the QUILT! I love your sunset! Don't enter me in your giveaway, but my favourite sunsets were when we lived in Igloolik, Nunavut. The sunset colours would wrap all the way around the whole sky and had the most amazing colours. I love sunsets at the beach....I don't get there very often so I appreciate each and every one! 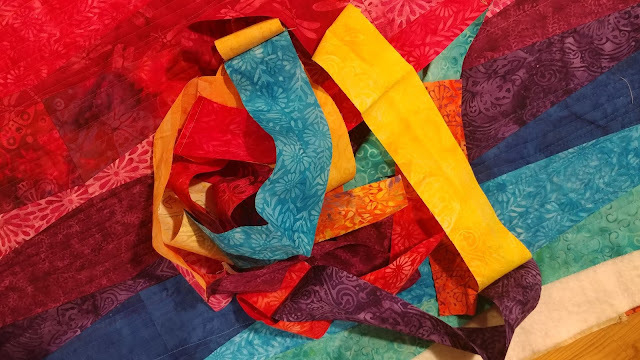 Gorgeous pictures of your quilt! Great post and fabulous quilt. Interesting, I've not quilted on the frame with a pieced back. Perhaps I don't get around enough but you are the first longarmer I've come across who has. 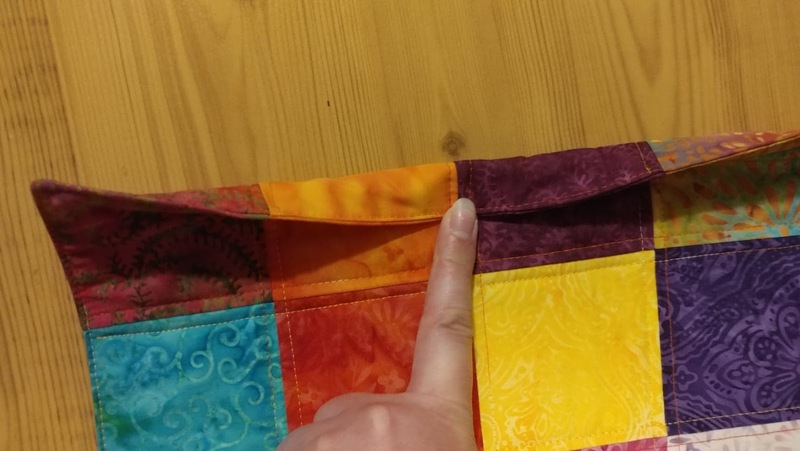 Did you do anything different with the pieced back than you would with a solid backing? My favorite sunsets are always at the beach. They just can't be beat. Beautiful quilt. My favorite sunset was in Mesa, AZ. Very unusual cloud formations and beautiful colors. You make the best quilts! My favorite sunset was over a lake not far from our house. We rent a cabin on the shores of Lake Superior in the Upper Peninsula of Michigan frequently in summer. The sunsets there are spectacular every night that it is not cloudy. Everyone plans their evening meal around the sunset time so they can be out on the beach to enjoy it! Your Sunset quilt is awesome!!! My favorite sunsets were the ones I saw from my bedroom window in the house I grew up in. The view was of the houses of the small town and the town clock against the hill where the sun went down. My favorite sunsets are in Hawaii!! Breathtaking on any island! My favorite sunset was on the Gulf on Sanibel Island. Beautiful! Your quilt is also!! My front yard which faces a large mountain range!!! We have only lived here 7 years so these are the best sunsets I have seen!!! Your quilt is just like a sunset, gorgeous with all the beautiful God made colors❤️❤️❤️❤️Than you for sharing your beautifub creation. Best sunset I saw was in Montana behind the mountains. This is absolutely beautiful, Laura! I love the sunset; you've really captured it well. Ocean sunsets are always my favorites. I'm about 45 min. from the Oregon coast and go down for a few days every chance I get. I love the colors in your quilt; so beautiful. 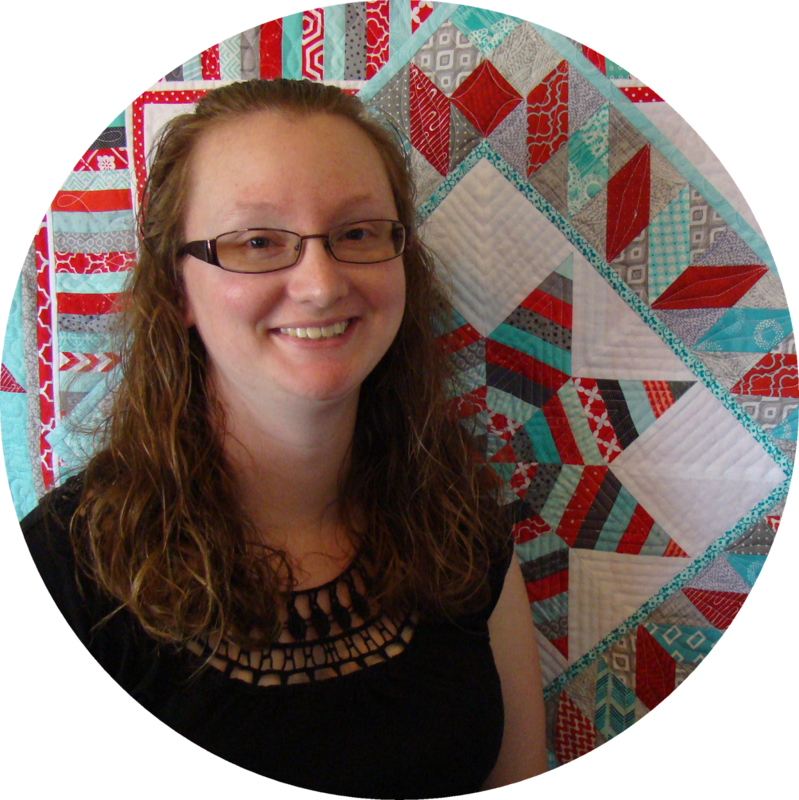 I'm a fairly new quilter and am looking forward to following you and learning new things. Very pretty! My favorite sunset is in Florida on a beach. On our farm in eastern Washington...fire in the sky that looks remarkably like your sunset! LOVE your quilt...simply stunning!!! Amazing. How creative for the block shapes. I think my best sunset was in South Africa. On the pier in Key West where we lived for 2 years in the 80's. Lot's of entertainment and beautiful sunsets. I love looking at the sunsets over Lake Erie. Your quilt is amazing! Those fabrics do remind me of a warm sunset, so your choice of quilt pattern is perfect. Love the end result--it's so beautiful! I have seen many beautiful sunsets at the beach, and in Hawaii; but I see a lot of spectacular ones from my front door in California. 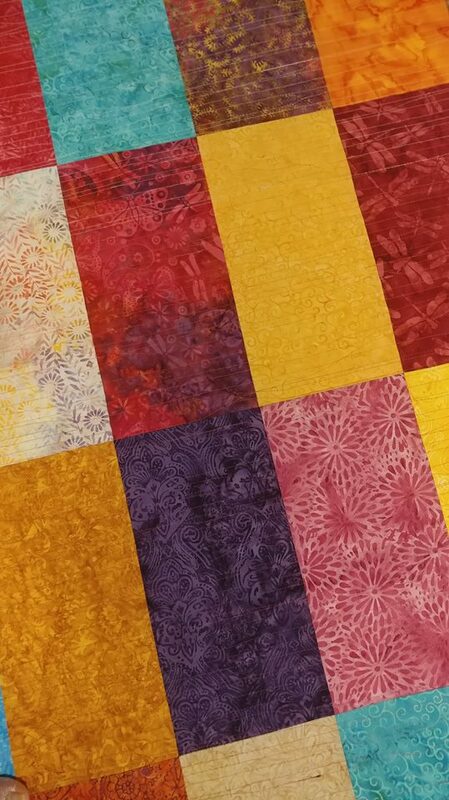 Lovely sunset quilts. The colors are so vibrant. My favorite sunset was with my father in the Bahamas. It was our last trip together sailing on a boat enjoying the sunset. Great quilt! I’ve seen wonderful sunsets from fire lookout towers in Montana. My favorite sunset was from our hotel balcony overlooking the Pacific ocean in Newport, Oregon. The sunset is beautiful and I love the 4 columns as an approach to putting it together - just terrific! Nice pics too! I enjoy your quilts, simple yet dramatic (not simple as in easy to make, though). My favorite sunset was off the stern of a cruis ship. My favorite place to see sunsets is at my home. Nothing like watching the sunset in the country. Beautiful quilt and interpretation of a sunset with fabric. You are very talented and creative. Gorgeous, gorgeous quilt! Thanks for the chance to win your scraps! My favorite sunrises and sunsets are the ones I see from our home (we live out in the country with great east/west views! Love your quilt. When I saw the first picture I saw curves. Then read how you made it and I had to go back to look at the first picture again. My favorite sunset was in Puerto Vallarta, Mexico. Boulder Colorado, I was living there for 8 months and it was breathtaking! Gorgeous, and great photo area. Wonderful job. Sundays at the beach are the best. Lovely!! Thanks for sharing how you created this beautiful quilt. I feel like I am in a tropical paradise. I love sunsets and my favorite were during the time I lived in Santa Fe, New Mexico. Every night was spectacular! I live in Florida, so we always have beautiful sunsets. Such a beautiful quilt. I've seen lovely sunsets here in the Sierra Nevadas and as the sun is setting over the Pacific Ocean. Didn't realize Missouri had such winterlike weather. More than we have had here this year!! Oh wow - that is so beautiful - and it does remind me of sunsets!! Like the ones off of my deck looking over the rockies! Beautiful! You captured the feeling perfectly in this quilt! Great use of the fabrics. I like catching sunsets in our community garden in the summer. This is gorgeous!! Love the backdrop too. Fantastic!! 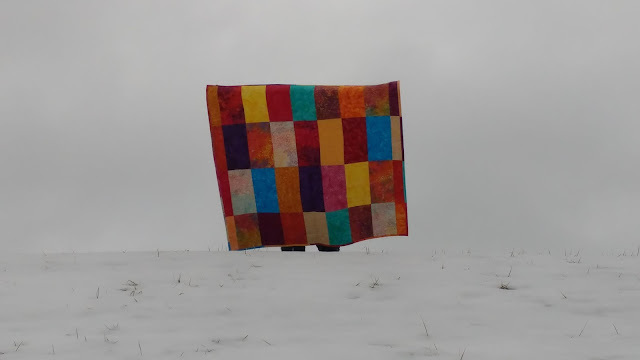 Your quilt is beautiful Laura and great photography! 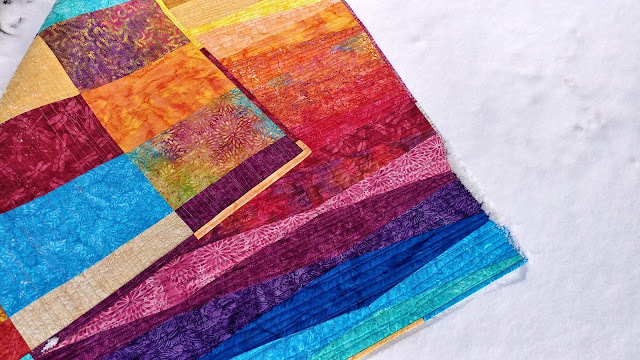 Love your quilt and love batiks. What a beautiful combination! I've always loved the sunsets in Puerto Rico! What a beautiful sunset quilt. The Boho fabrics are perfect. My favourite sunset was in Wells in northern British Columbia. As soon as the last bit of light and color faded from the sunset, the northern lights started to dance! We have beautiful sunsets in our backyard. Wow your quilt is awesome! I LOVE the photo setting with the waterfall. It really makes your quilt POP!! Great pattern. Some of the best sunsets I've seen have been when we were visiting the Smokies with the mountains in the foreground. Beautiful! 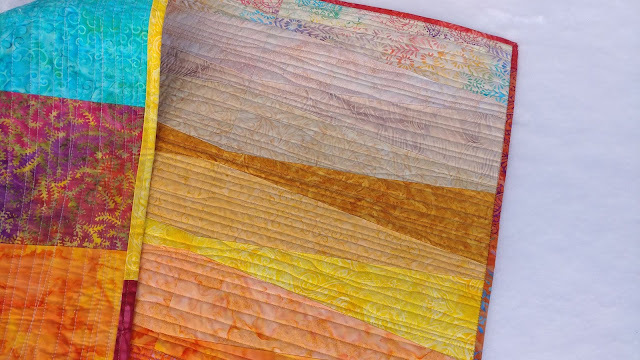 Terrific sunset quilt Laura. We are getting spectacular sunsets at the moment with all the summer dust in the atmosphere. Fav sunset was on the island of Hawaii. It was so beautiful over the water, just breathtaking, like your quilt. You did a fantastic job on it. The colors are so relaxing. Makes me think of the islands. Good use of pattern in this one. Simple to explain but looks so much more complicated. My favorite sunsets are in Nebraska. I love the Boho colors--absolutely beautiful! Beautiful sunset and use of all those pretty colors! 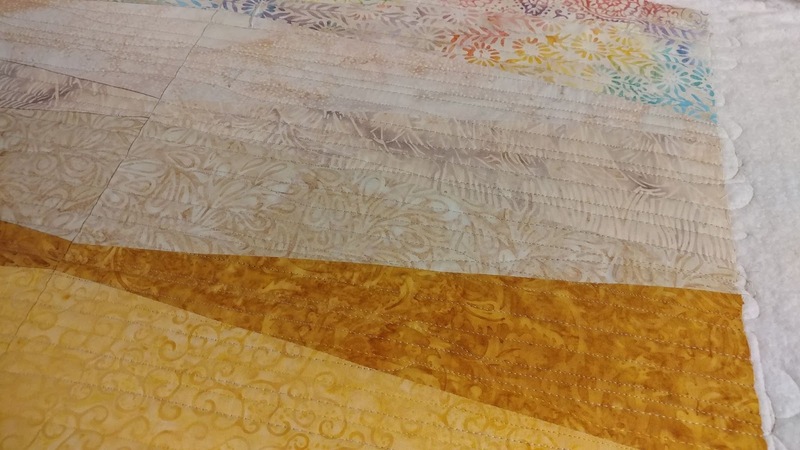 gorgeous quilt!reminds me of the sunsets in central and west texas. The colors in this are so perfect for a sunset! Lovely job as usual. Thanks for sharing on Wednesday Wait Loss. Thank you so much for the fabric! I was expecting scraps but I think there is enough to make a quilt. I love all the colors.